Bird’s Nest Corals are species of Seriatopora, a fast growing small polyp stony (SPS) coral known for bright colors and thin delicate branches that form a dense tangled cluster. 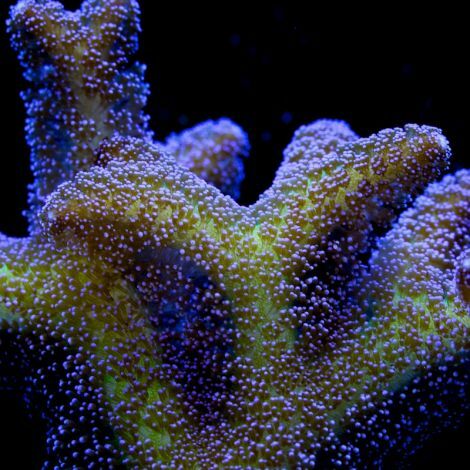 They are different than most SPS in that they seem to prefer lower lighting environments and tend to bleach under lighting that is too intense. Tidal Gardens propagates these corals extensively at the greenhouse. The only issue we have with bird's nest coral is shipping them. They are VERY fragile and sometimes arrive broken. The coral itself is extremely hardy and will regrow, even from the broken pieces, however transport (even over short distances) always seems to take its toll on the colony's shape.